Anytime it rains in Houston there is the possibility of high water areas. Especially if there are two to three inches of rain over a brief period of time. It’s easy to misjudge the depth of floodwaters and get yourself in a bad situation. An important rule of thumb to keep in mind is that if you can’t see the curb, don’t drive into the water. A normal passenger car sits approximately six to eight inches off the ground so it doesn’t take much to flood your vehicle. In fact, it only takes a foot of water to float a car and two feet of moving water can carry away most vehicles. Once your vehicle is floating, the floodwater becomes your steering wheel causing the chance for the vehicle to be swept away, tipped over, or flipped. The worst decision one can make is attempting to drive into floodwaters. Just wait it out, the good thing about Houston is that the water recedes fairly quickly. As the National Weather Service has campaigned for years: “Turn around, don’t drown!” If you must drive, stay informed with weather and traffic updates through the National Weather Service and live Houston traffic updates. According to Flood Safety, flash flooding is the leading cause of weather-related deaths in the U.S. There are approximately 200 deaths per year with over 50% of flood-related drownings are in vehicles. Texas leads the nation when it comes to flash flood deaths with 76% of deaths are vehicle-related. The good news is that you can escape a sinking vehicle. If you are stuck in your vehicle underwater, you have an average of 30 to 60 seconds to get out alive. It is natural to find yourself in panic mode and wanting to call 911 as the emergency is happening. However, the best thing for you to do is not to call 911 until you get out of your vehicle. Remain calm and act quickly. Time is critical as every second count for survival. It is best to focus on getting out of your car first and calling 911 once you’ve made it alive. Here are some basic tips to keep in mind. Unbuckle your seatbelt to give yourself the flexibility to maneuver and escape. Open or break the passenger window before the water rises. Opening the door will be very difficult against the water pressure. Vehicles with power windows can be difficult as the electrical system may shut down once the car hits the water. If you are unable to roll your window down, break the window using your headrest or a rescue tool such as a Swiss Army knife or a small hammer. When a car is sinking, it will tilt forward causing the water to push against doors and windows. If you are unable to get the window open, keep trying until you are able to escape. 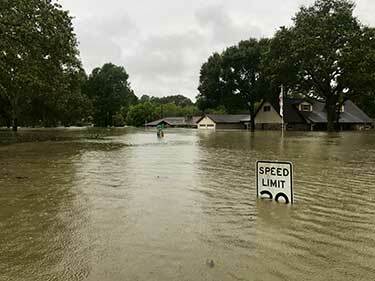 The Harris County Flood Control District’s Flood Warning System (FWS) measures rainfall and monitors water levels in bayous and major streams on a real-time basis. The FWS is used by local and national agencies to inform users of potential and current flooding conditions in the area. Houston Transtar reports real-time high water locations in Houston-area roads. By using these resources proactively it allows you to take appropriate precautions during times of heavy rain and flooding. Jensen Dr. at South of Bennington St.
7000 Main Street at Holcombe Blvd.